Wouldn't this make a lovely Christmas greeting card? 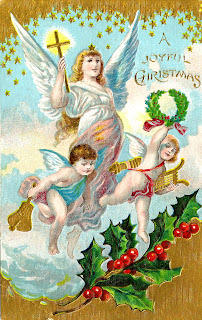 This is a vintage Christmas postcard decorated with beautiful images of Christmas angels. And, isn't the sprig of holly leaves and berries just wonderful?! I hope you enjoy this lovely graphic in your Christmas projects!